Join bank robbery specialists Larry and Carl when they pull of a major bank job. Click here to play! 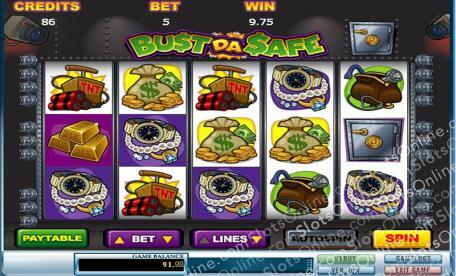 If you can blast this vault, you'll be walking away with plenty of big cash wins! The Bust da Safe logo is a pretty important symbol in this bank heist. It acts as a wild and will replace most other symbols. If you can spin one to five of them across an active pay line you'll get up to 2500 times your line bet. The main goal is to grab the cash. Spin one to five bank bags full of money and you'll get up to 1000 times your line bet. There are also bars of gold for the taking. Spin one to five of these and you'll get up to 500 times your line bet. You'll also need your tool bag and TNT, but watch out for the guard dogs and police if you want to complete your job. All of these symbols will bring in plenty of cash if you can spin them across a pay line. The safe is where all of your treasures are hidden. Spin this symbol on selected reels to trigger a number of free games. Your bank-robbing partners will help you out in a big way. Spin either of the fellas, the bank or a combination of the three and you will trigger the Bust da Safe bonus for even more chances to win. Don your black mask and stripy sweater for a chance to spin in plenty of cash prizes! The safe icon acts as a scatter. If you can spin this symbol on reels 1 and 5 and you will trigger up to 12 free spins. During free spins the scatter symbol and three bonus symbols are inactive. The Bust da Safe logo acts as a substitute. It will replace the bag of cash or gold bars to help you create more winning combinations.